The art of bowling – particularly of the pace variety – has been the main fixture of this Ashes campaign; the Australian public entranced by cart-wheeling stumps, the dull thud of leather on skin and the shuttering clunk when the Kookaburra strikes further north. Test cricket has never been so entertaining. Indeed in an age of waning attention spans, various spells of bowling throughout the series have proved simply irresistible. Eye’s ogle, hair stands on end, heart’s race, palm’s sweat, and clichés run thin. So let us indulge now that the Ashes have been returned in the most comprehensive fashion possible. Within I will revisit the most aesthetically pleasing wickets from Brisbane to Sydney. All Australian and England wickets are eligible, however as you will undoubtedly notice there is a skew toward the Australian contingent, something justified by the shear disparity of wickets taken by each attack during the series (99 Australia – 55 England). Ratings will be supplied for each wicket, with points added or deducted for the state of the game when the wicket fell. One of two first-ball ducks produced by Johnson in the innings. 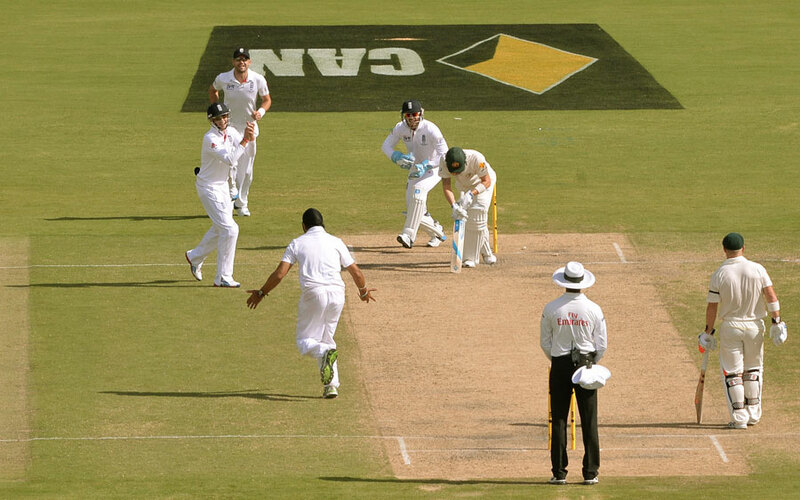 Ushered in by a bloodthirsty Adelaide crowd, Broad was preemptively jumping before the ball left Johnson’s hand. Instead of receiving a bouncer as anticipated, England’s chief antagonist received a length ball, consequently his exposed leg stump was left at 45 degrees from the Johnson thunderbolt. A left-handed bowler over the wicket to a left-handed batter, an interesting ploy from Johnson to Carberry who looked set to this point (40). Johnson cramped the 33-year old Ashes debutant for room when the fast-bowler speared one in around chest height. 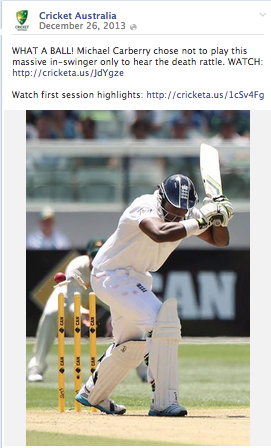 Carberry – attempting to play inside the line of ball – nicked to Shane Watson at first slip. As the English donned the white flag and in the process the inglorious title of whitewash series victims, Nathan Lyon landed a beauty. From around the wicket to the left-hander, Lyon pitched the ball outside leg stump spun it onto middle, took the edge and was brilliantly caught by a soaring Michael Clarke at first slip. Two centuries in his last two innings (113, 148), it took a lovely tweaker from Monty Panesar to dismiss the Australian, who looked good having compiled 22. Pitched on middle and leg, turned into off-peg. Gorgeous delievery. Loses full point with the wickets impact lessened, as England already trailed to the tune of 463 when Clarke fell. I’m quite certain (correct me) Jonny Bairstow didn’t even get a glimpse of it; a ball probably wasted on a cricketer of his caliber. Lovely inswinger to the right-hander pitched on off stump and hinted in off the pitch a fraction also. The tourists sought to test a perceived inability of Michael Clarke to hook and pull off the back foot, especially to Stuart Broad, in the first innings at the Gabba. The theory payed dividends, when Clarke meekly fended one to Ian Bell in close. However this would be the first and only time the strategy would a exult a return, with Clarke showcasing the hook and pull stroke in a game changing knock of 148 in the second innings. Evidence that not all theories work in practice. Further evidence: communism. Point for strategy, half a point lost for an ultimately flawed strategy. Buttered up by relentless short pitch bowling, Johnson’s attempted yorker caught Broad leg before wicket. Grimacing, Broad was left to hobble back to the pavilion – and later the hospital – with a bruised ankle. Smiling, Australian’s around the country (cruelly?) reveled in his pain. For this reason an extra point has been duly added. The seed of doubt was planted in Brisbane and harvested in Adelaide. The short-stuff had Cook’s feet in a foot of concrete, incapable of moving forward to Johnson. Johnson slung down a length ball on off stump, which slightly straightened and cannoned into off stump. The vision isn’t pretty. Still unsure if he would of hit the ball had held its line, missed it by at least half a foot. Good bowling or bad batting? the question is enough cause for the loss of half a point. An uncharacteristically mundane session (in comparison to the first three tests) England was coasting after being sent in by Michael Clarke at one-for ninety odd. Clarke threw the ball to Shane Watson. Around the wicket to the left-hander Micheal Carberry, the preceding ball Watson bowled was an outswinger. Carberry did not offer a stroke. The next, from wide of the crease, Watson bowled a romping inswinger, Carberry promptly left and the ball collected the top of off. Massive wicket in the context of the game. Set-up earns extra point; the fact that he could of easily avoided the dismissal through the use of the twig in his hand is recourse for the loss of half a point. Perfection. Utterly unplayable first ball of the innings to the English skipper, who endured a horror tour down under, after his 766-run Man of the Series performance in 2010/2011. Harris landed the ball just in front of a glaring crack on middle and leg to the left-hander; the ball hit the seam subsequently dislodging the bail at the top of off stump. More than a wicket, Cook’s dismissal demoralised their opponents as they set out in search of 503 to win. From this moment Australia had one hand clasped on the Urn. Callum Godde is a third-year Journalism (sport) student at La Trobe University and is thankful he didn’t get around to writing a retort of Dean Jones’ article ‘Stop your moaning: Australia can win the Ashes’ in November. 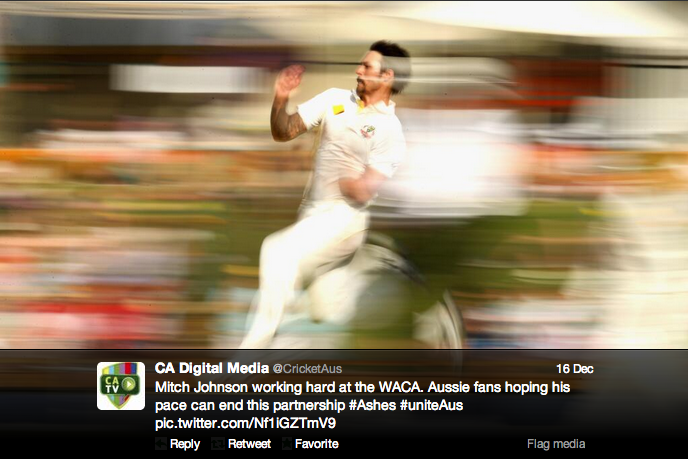 If you have another favourite wicket of the 2013/2014 Australian Ashes you can tweet him @Calgodde.